Are you looking to protect your pool? A pool is a huge investment, one that needs to be protected. A fence’s main purpose is to do exactly that, protect. You can protect your home and your investments with a proper fence, but which type is best for your pool? Thankfully, that’s what we’re going to go over today. Ready to learn more about the kind of fence that is best for your pool? We’re going for it! 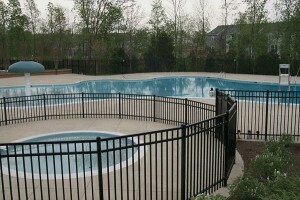 Protect your investment with a pool fence. Pools mean water. Though your fence isn’t right next to your pool, it will still probably get wet from time to time. This makes cast iron or wood somewhat less desirable than vinyl. Vinyl fences are largely unbothered by water and make excellent pool fences. If you’re looking for a fence with a smaller price tag, then consider chain link. Ready to get the pool fence of your dreams? If you have any questions about Hercules Fence and our community service endeavors, please contact Hercules Fence of Manassas, Virginia by calling (703) 551-2609 or visiting our website. Also, like us on Facebook, follow us on Twitter, put us in your Google+ circle, and watch us YouTube! This entry was posted on Friday, July 10th, 2015 at 7:15 pm. Both comments and pings are currently closed.